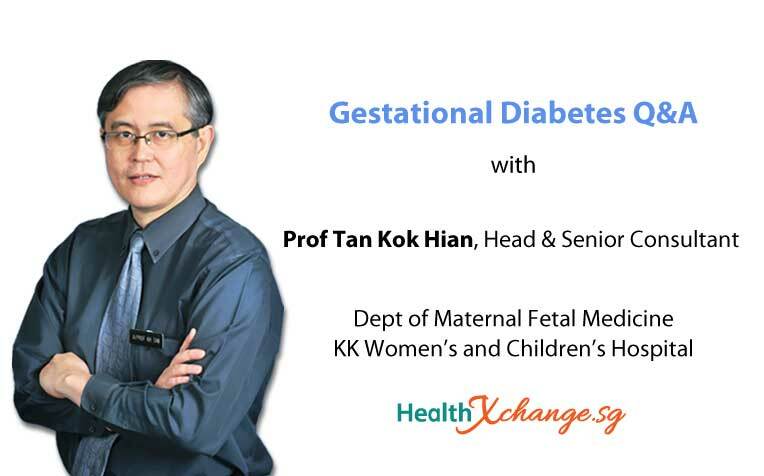 Ask Prof Tan Kok Hian​​, Head and Senior Consultant of the Perinatal Audit and Epidemiology Unit, Department of Maternal Fetal Medicine, KK Women’s and Children’s Hospital, about gestational diabetes. ​anything you have ever wanted to know about gestational diabetes. It is common for blood sugar to rise during pregnancy because of hormonal changes. But if a pregnant mother's high blood sugar levels persist, she could develop gestational diabetes mellitus (GDM), which is harmful to both mother and baby. If you have questions on gestational diabetes, don't miss this opportunity to ask our specialist of the month – Prof Tan Kok Hian​​, Head and Senior Consultant of the Perinatal Audit and Epidemiology Unit, Department of Maternal Fetal Medicine, at KK Women’s and Children’s Hospital (KKH), a member of the SingHealth group. Prof Tan Kok Hian is the Head and Senior Consultant of the Perinatal Audit and Epidemiology Unit, Department of Maternal Fetal Medicine, KKH. He is also the Lead for Gestational Diabetes Mellitus (GDM) at the SingHealth Duke-NUS Diabetes Centre and the Lead Principal Investigator of the NMRC-funded Integrated Platform for Research in Advancing Metabolic Health Outcomes of Women and Children. Prof Tan initiated universal screening and the new International Association of Diabetes and Pregnancy Study Groups criteria in KKH and Singapore General Hospital since Jan 2016, based on a cost effectiveness study of GDM screening under the Growing up towards Healthy Outcomes study. He is also the Chairperson of the College of Obstetricians and Gynaecologists, Singapore GDM Committee 2017-2018 and Chairperson, Expert Group GDM Appropriate Care Guide of the Agency for Care Effectiveness, Ministry of Health 2017-18. Prof Tan will be one of the speakers at the upcoming "Healthy Pregnancy, Healthy Baby" forum, which will take place at KKH on 15 Sept 2018, 1.30pm to 4.30pm. Here are details of the forum and how to register. ​Registration ​Pre-registration is required. Seats are confirmed upon full payment on a first-come, first-served basis. Registration fee is non-refundable. Registration closes on 13 Sept 2018 (Thurs). To register, please log on to www.kkh.com.sg/healthseries to fill up the registration form.